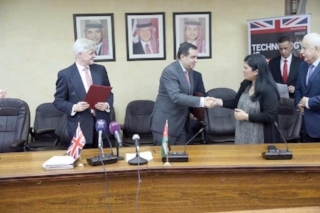 On August 16, 2017, Jordan and the United Kingdom signed an Memorandum of Understanding to establish the Sir Isaac Newton-Khalidi Fund, in recognition of the contributions of Usama to science and technology in Jordan and the Arab world at large. The £3.5 million memorandum will be implemented through the Higher Council for Science and Technology (HCST) and the Royal Scientific Society (RSS) over four years in the areas of energy, cultural heritage, water security, agricultural technology and food security, biotechnology and biosecurity, nanotechnology and developing the skills and abilities of researchers. HRH Princess Sumaya bint al-Hassan, who is the president of the RSS, said the agreement would help create a "policy and enterprise infrastructure that goes beyond politics and political missions"
The Newton-Khalidi Fund will be officially established at the at the closing ceremony of the World Science Forum in the Dead Sea in November 2017.